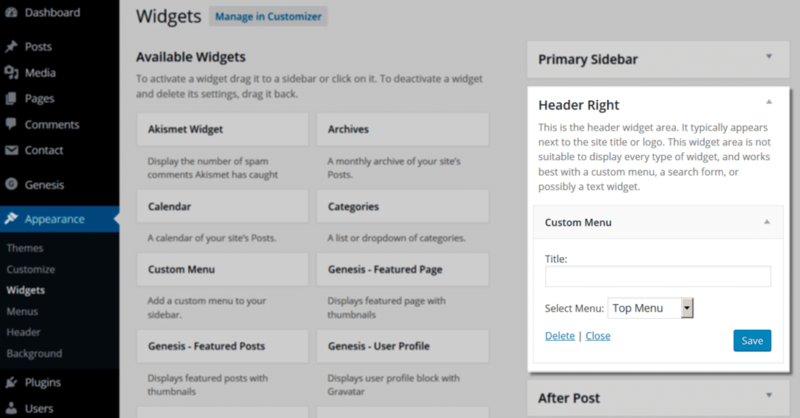 In our side-style themes we include the site navigation in the Genesis Header Right widget area. It appears below the site title or logo. This widget area is not suitable to display every type of widget, and works best with a custom menu, search form, or possibly a text widget. To include your site navigation, first set up your custom menu under Appearance > Menus. Once created, go to Appearance > Widgets and drag and drop the Custom Menu widget and next to Select Menu, select the custom menu you created. Don't forget to click 'Save' to preserve your changes.